Heterodontosaurus are a genus of dinosaurs that lived in the early Jurassic period in South Africa. They are characterized by prominent canine teeth and reach a maximum size of about 3 feet in height (about the size of a big turkey). These small dinosaurs are believed to have opposable fingers which allows them to hold and manipulate their food and other objects. The hand of this dinosaurs have five fingers. Another interesting feature of the dinosaur are its teeth. It had three different types of teeth as opposed to most other dinosaurs which has only one type. It had small teeth at the front of the jaw, a pair of long tusk like teeth in the jaw, and the third are tall and squarish teeth likely used for chewing. The name, Heterodontosaurus means "different toothed lizard". Prior to the current discovery, heterodontosaurus were thought to be omnivores that ate both plants and small animals. The single specimen of the new species was originally chipped out of red rock in southern Africa in the 1960's and discovered in a collection of fossils at Harvard University by National Geographic Explorer-in-Residence Paul Sereno, paleontologist and professor at the University of Chicago. Details of the dinosaur's anatomy and lifestyle are part of a monograph by Sereno dedicated to these puny herbivores and published in the online journal ZooKeys and on the website of the National Geographic Society. Named Pegomastax africanus, or "thick jaw from Africa", the new species has a short parrot-shaped beak up front, a pair of stabbing canines, and tall teeth tucked behind for slicing plants. The tall teeth in upper and lower jaws operated like self-sharpening scissors, with shearing wear facets that slid past one another when the jaws closed. The parrot-shaped skull, less than three inches long, may have been adapted to plucking fruit. "Very rare", admits Sereno, "that a plant-eater like Pegomastax would sport sharp-edged, enlarged canines" like that of a vampire. Some scientists have argued that consuming meat or at the least insects was a good part of the diet of heterodontosaurs, which evolved near the root of the great bird-hipped radiation of dinosaurs that includes the famous plant-eaters Triceratops and Stegosaurus. Self-defense and competitive sparring for mates is more likely their role, argues Sereno in the study, based on microscopic examination of the teeth of Pegomastax and kin. Wear facets and chipped enamel suggest that the fangs of Pegomastax and other heterodontosaurs were used like those of living fanged deer for nipping or even digging rather than slicing flesh. A bizarre covering of bristles, something like that of a porcupine, likely covered most of the body of Pegomastax, which measured less than two-feet in length and weighed less than a housecat. These bristles first came to light in a similar-sized heterodontosaur, Tianyulong, discovered recently in China and described in the study. Buried in lake sediment and covered by volcanic ash, Tianyulong preserves hundreds of bristles spread across its body from its neck to the tip of its tail. In life, dwarf-sized heterodontosaurs like Pegomastax would have scampered around in search of suitable plants, says Sereno, looking something like a "nimble two-legged porcupine". When Pegomastax lived some 200 million years ago, the supercontinent Pangaea had just begun to split into northern and southern landmasses. 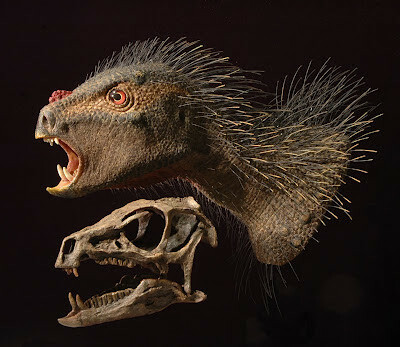 Heterodontosaurs appear to have divided similarly, the study argues, the northern species with simple triangular teeth like Tianyulong and the southern species with taller crowns like Pegomastax. Sereno marvels at these punk-sized early herbivores that spread across the globe. Although virtually unknown to the public, "Pegomastax and kin were the most advanced plant-eaters of their day". Older Than Estimated - Genome Show Polar Bear Existed 600,000 Years Ago.